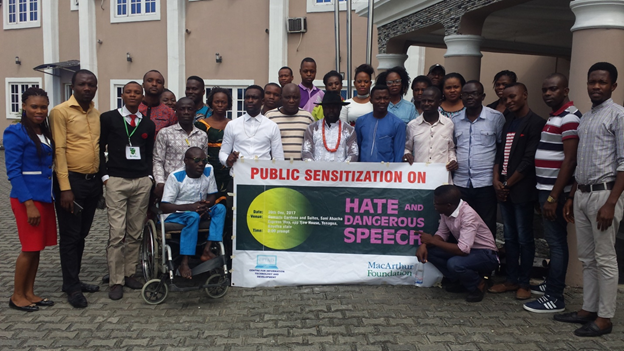 People Sensitized on Hate and Dangerous Speech in Bayelsa. In her quest to curb Hate and Dangerous Speech both online and offline, the Center for Information Technology and Development (CITAD) under it’s MacArthur Foundation’s supported project on monitoring and countering Hate and Dangerous Speech in Nigeria has embarked on public sensitization in different parts of the country with a view to educating people on the concept as well as equipping them with available mechanisms to join the crusade against Hate Speech. With growing number of Nigerians on social media and the continuous dissemination of Hate Speech and rumour on social networking sites, CITAD finds it useful to enlighten the public on Hate Speech and encourage them to avoid it for societal peace, unity and progress. Today’s public sensitization in Yenagoa, Bayelsa state is coming two days after similar sensitization has taken place in Owerri, Imo state. The public sensitization focused on making the participants to understand in clear terms what Hate Speech is, what it can cause, how it can be identified, how to avoid and counter it, how to report it especially on the platforms they are made and many other issues around it. Commenting at a general discussion session, some participants expressed concerns on Hate Speech on social media and called on stakeholders at different levels to wake up to their responsibility and salvage the threatened unity and peaceful coexistence among people of different religions and tribes, a participant, Pastor Wisdom Akinyosoye promised to take the campaign to his pulpit in order to get more people sensitized on Hate Speech. Participants to the sensitization included religious and traditional leaders, civil society organizations, youths groups, political parties representatives, women groups, students associations, people living with disability (PWDs), and the journalists among others. 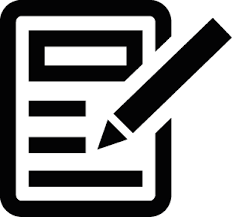 PreviousPrevious post:Communiqué issued at the end of Public Sensitization on Hate and Dangerous Speech organized by Center for Information Technology and Development (CITAD) on Monday 18th December, 2017 at City Global Hotel, OWerri, Imo State. PreambleNextNext post:Stakeholders Meet to Validate Research on Gender Violence Against Women Online.